Put the slices of bread on a grill, toast until crisp but not burnt. Rub the garlic over the bread. Drizle the Punta Licosa EV Oil over the bread, add some salt to taste. Serve immediately. 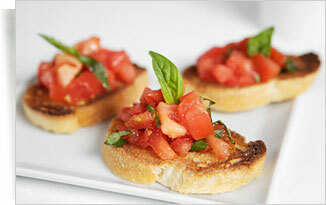 Bruschetta with tomatoes & basil – cut the tomatoe into small cubes and the basil into small bits. Spread the basil and tomatoes over the pieces of prepaired bread. Bruschetta with olive patè – spread olive patè and finely chopped celery over the prepaired bread. Bruschetta with mozzerella and anchovies – place a few pieces of mozzarella on the bread, add a pinch of oregano and drizzle olive oil on top.